Ladies and gentlemen, welkom na Bassline, one of Joburg busiest and electrifying jazz venues. Originally opened in 1994, the club has quickly become one of South Africa’s main stages. During these years, Bassline has hosted over 3’000 concerts, very impressive! Johannesburg is one of Africa’s most beautiful and respected cities. Leaving behind the cultural clashes and fights of the Apartheid era, Joburg was reborn and it has quickly become one of the best African cities to live in. The metropolitan area features quite a few jazz venues, presenting both local and international stars during the year. Today we take you to Bassline, one of South Africa’s top live music venues. Founded by Brad Holmes and opened in 1994, Bassline began its activity as a small live music spot. It rapidly became one of the South Africa’s finest places to experience the top of jazz and Afro-beat, funk jam sessions and even poetry readings. After a year of break in 2003, Bassline relocated to a new area, the downtown Newtown Cultural Precinct in 2004. To the new look, a 1000-capacity concert venue, an intimate 150-seat performing space and an excellent acoustic were added. Bassline has become an institution among music fans. During its years of activity, it has hosted over 3000 gigs, featuring many of Africa’s most famous artists and world music icons, as well as most of the South African acts that emerged during the ’90s (names like Paul Hanmer, Vusi Mahlasela and the late Moses Molelekwa and Zim Ngqawana). And if this was not already enough, Bassline has also become a successful concert production house, organising the incredible outdoor Africa Day and New Year’s Eve concert over a number of years. Remember this name, Bassline. 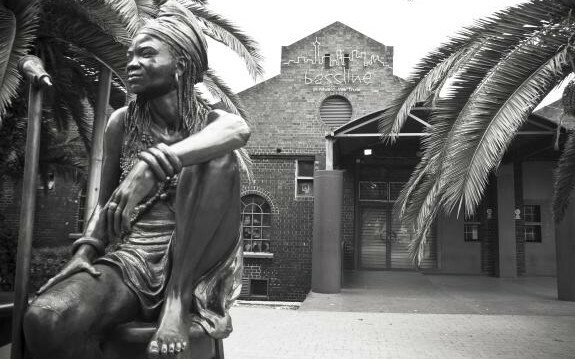 An excellent top of the range sound, a huge concert space and intimate performance area, a history of success and the life-seize bronze statue of the legendary South African queen of pop Brenda Fassie welcoming you at the entrance. No matter what brings you to Bassline there is one thing that is sure: you will keep coming back.